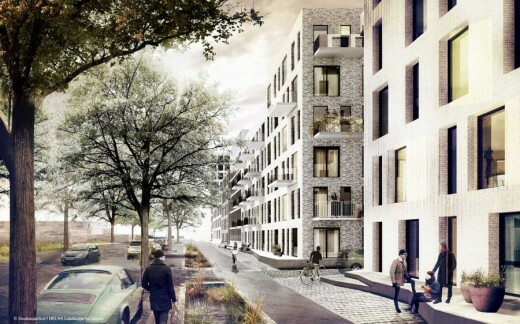 Studioninedots and DELVA Landscape Architects present the dynamic masterplan Buiksloterham, commissioned by housing corporation de Alliantie. 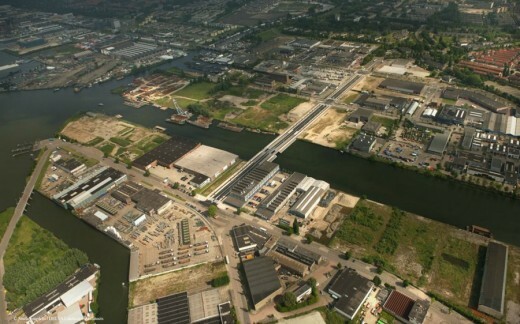 Through an innovative urban, landscape and social development plan, the former Nedcoat and Air Products sites in the harbour area of Buiksloterham will be regenerated in a sustainable way. The monofunctional industrial district will be transformed into a vibrant new part of Amsterdam that will function as a living urban lab. The dynamic masterplan forms the basis for future developments which will include 550 residences and at least 4,000 m2 of work units and hospitality locations. With its central location on Amsterdam Noord – also known as the sunny side of the IJ harbour – this northern part of the city has wide appeal. The client, De Alliantie, is keen to develop the site not in a conventional way in large, fixed blocks but as part of a flexible urban planning concept called Cityplot. Initiated by Studioninedots, the concept was further developed together with DELVA Landscape Architects in the specific context of the site: the result is Cityplot Buiksloterham. The concept is a dynamic process that combines self-build projects with social housing, work/home units and social hubs, bringing together individuals, collectives, investors and small-scale developers. 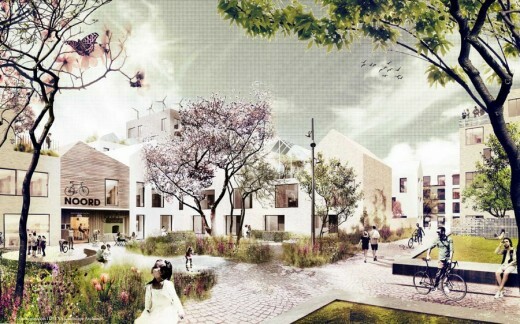 As opposed to a traditional urban plan with a fixed end result, Cityplot Buiksloterham will keep evolving. The proposed allotments are therefore only a suggestion and the area will continually adapt to the needs and demands of its inhabitants. The process will closely engage the Planning Department of Amsterdam, Waternet and future residents. Cityplot arose from the need to reconsider how conventional urban planning strategies could open up to more flexible models of development. 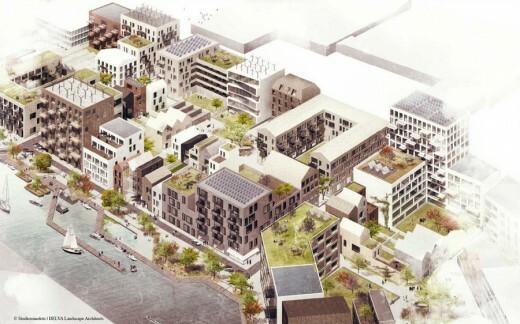 The concept proposes compact, flexible city blocks composed of small-scale, mixed-use developments. In this way, the different functions and experiences normally dispersed throughout the city are compressed into an intensive Cityplot. Architecturally, this translates into a compact plot layered with different building typologies. The concept is based on an ideal plot size of 100×100 metres; this generous size not only provides scope to accommodate diverse building typologies but also allows the format of the block to be opened up from the street as well as internally. The reduced scale of the plots with this more open framework enables flexibility for development in a more economically-viable manner, i.e. in smaller steps as opposed to large developments. This creates a more inclusive form of development that engages everyone from private individuals to investors. Buiksloterham has a history of self-build projects, the first constructed at the beginning of the crisis on individual plots. The different developments as a whole contributed a positive vitality and diversity to the surroundings which Cityplot Buiksloterham aims to continue. The dynamic masterplan retains individuality while engaging residents to shape their own city. Based on a collective/participatory approach, the development process is informal and dynamic, is focused on the act of doing and offers room for experimentation. Residents may themselves decide the function and architecture of their plot within a set of guidelines – provided to ensure coherence and diversity – and are involved in the shaping of the public spaces. Shared car and bicycle parking facilities are provided – helping also to keep the streets pedestrian-friendly – and residents share responsibilities for energy generation. The small scale and mixed-use nature of Cityplots supports ongoing dialogue that is essential for community engagement – dialogue between architecture, functions and participants, and between the city and the economy. Cityplot aims to create a lively, sustainable environment that invites people to come live, work, relax, and do business. In this way, the dense, mixed-use and small-scale character of the concept naturally generates a dynamic, informal energy for the local economies and inhabitants which is enhanced by the presence of meeting places and creative enterprises. Tapping into this energy are Urban Activators, designated hubs for meeting and working such as cafes, studios/ateliers and co-working spaces. As opposed to being temporary pop-up initiatives that are removed once an area has been regenerated or gentrified, Urban Activators are permanent features from day one which are vital for ensuring a socially and economically interesting neighbourhood. In order to attract creative enterprises, Cityplot aims to connect with the network of creative industries in the immediate surroundings, and potential residents are considered based on their contribution to the creative, innovative and sustainable character of the area. Cityplot would particularly appeal to young innovative entrepreneurs whose activities would function as a magnet for other like-minded professionals and activate new places for meeting. The public space plays an important role in connecting the different atmospheres of the neighbourhood. Differing scales of public space indicate the type of development to the future builder. Urban life in Cityplot Buiksloterham is extended above ground level to elevated communal gardens and surrounding rooftops. Public, semi-public, collective, and private spaces alternate on different levels and contribute to the creation of the ‘circular city’, inspired by the circular economy. Height differences are utilised to shape transition zones. As opposed to being hard edges, property boundaries are embraced to give character to the urban plan. Walls, fences and raises contribute dynamic contrasts between the private and public realm. 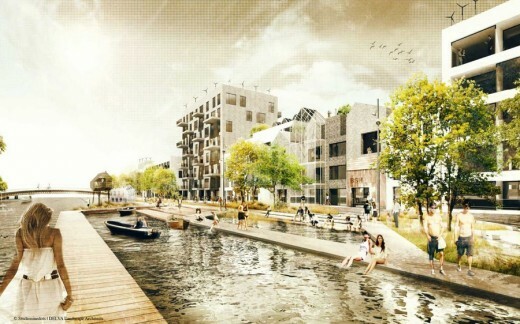 Water plays a key role in the experience of Buiksloterham. The Tolhuiskanaal, which runs through the area, is a prominent part of the neighbourhood and the quay is no longer a strict boundary between water and city, but is instead integrated into the public space. 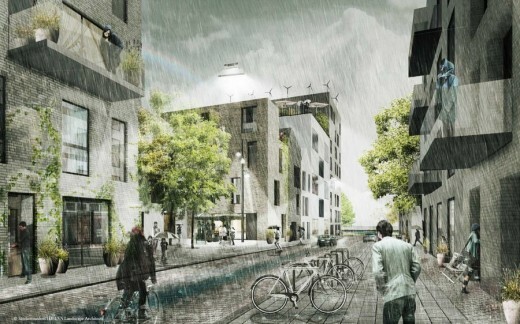 Instead of being drained underground, rainwater forms a visible and tangible element to enrich the urban plan – a first in the Netherlands on a large scale. The green courtyards in communal gardens, on ground level and on roofs retain and dispose of rainwater – this helps to avoid overflooding and promote stable climatic conditions. The streetscape accentuates the experience of (rain)water, for instance as it’s seen flowing along roads that slope gradually towards the waterfront or integrated into the sidewalks as landscaping features. A world of floating gardens, planks, greenhouses, and boardwalks contributes to the area’s unique identity. This new part of the city doesn’t fight against the water, but dares to play with it. 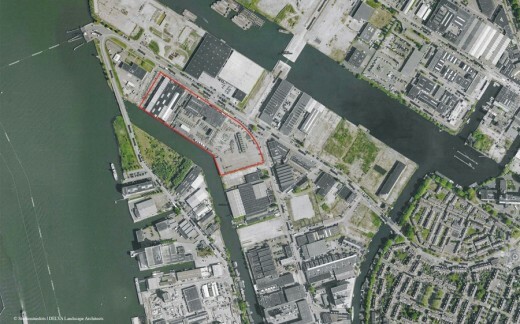 On April 15, a letter of intent was signed with the most relevant stakeholders to declare this area a ‘living lab’, supporting the ambition for Cityplot Buiksloterham to be testing ground for innovative urban development. Every Cityplot acts as a collective, energetic machine whereby sustainable systems are coupled with and converge in the public space. The interrelationship between residents and these systems will contribute to a sustainable and future-proof area. Architecture, public space and landscape will soon form one complete integrated system. In the meantime, several entrepreneurs have already expressed interest, the first blocks of social housing have been commissioned, the plans for the public space and waterfront are being developed, and the first collectives of self-builders have been invited to participate. For more information please visit: www.Cityplot-Buiksloterham.nl or www.studioninedots.nl/cityplot.